Bitter, Honey and Spice. Original oil on panel, 8" x 8". 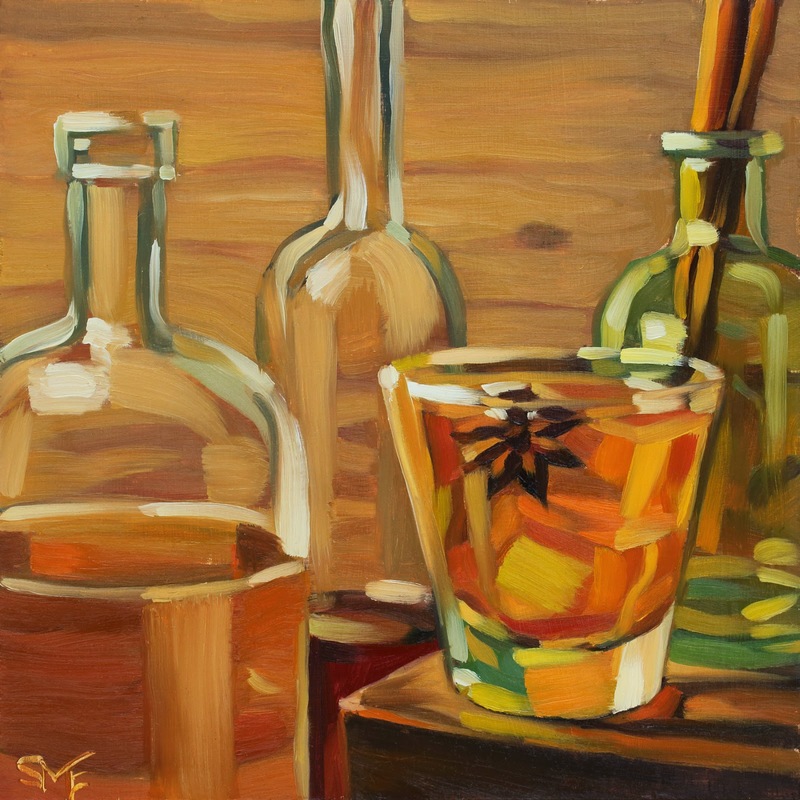 Three paintings into my second Mixology book, I decided to scrap it. Not the book---the three paintings. When I finished the first book I already had an idea how the second book would look. A book of modern recipes should look, well, modern. In my mind that means a clean design and simple, fresh-looking paintings. But, a little too taken with my new collection of props, I overloaded still life setups and made busy, futzy paintings. Not exactly what I was after. I didn't even want to post them, which was telling. It nagged at me until I reached a decision: reboot. It's early days, there's time. I sketched out some composition ideas and re-painted Bitter, Honey and Spice. I'm so much happier with this one! I suppose since I mentioned it, I should probably post the first painting. Grudgingly. If you're curious, it's below the break. 65th Street Cocktail. Oil on panel, 8"x 8". It's official: Mixology With a Twist is underway! 65th Street Cocktail is the first illustration for a new book with all new recipes from talented Northwest bartenders. This recipe comes from Curtis Day, bar manager for Casper Fry here in Spokane, and it's a tasty one. I've got about seven recipes collected so far, and already I've noticed some trends. First, while the vintage cocktails were heavy on the gin, the new cocktails all contain bourbon or rye whiskey. (I'll have to make a point of requesting some different liquors going forward.) Also, the old recipes were fairly simple. But modern bartenders love obscure ingredients: small batch craft bitters, hard-to-find liqueurs, and house-made syrups. Oh, and lots of giant ice cubes! 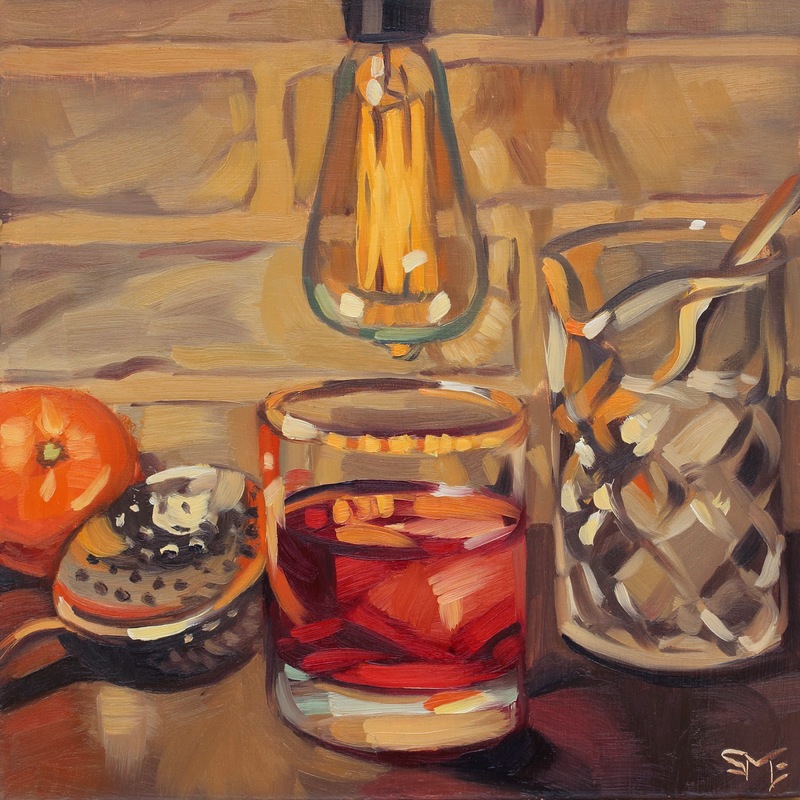 For the new book's paintings, I'm trying to capture the feel of the places where the drinks were invented. This has meant finding and creating new backdrops and bringing in new props (two of my favorite things!) I've made faux "old brick" walls, bought Edison bulbs, and even ordered a pack of flocked wallpaper samples. I'm so excited to start putting together this book! I'm hoping for around thirty recipes in all, and a release date in November, so I've got my work cut out for me…. After the jump: Fun with $27 brick paneling (before-and-after faux brick paint jobs). Richard serves his new creation to Amy, Tod, Kate, Paul, Tom and Teya. 2015 is here, and after a season of parties and a holiday week of flu, I am so ready to get back to work! Not that I've completely slacked off---plans are underway for a second book. I hope to publish Mixology With a Twist: The Art of Modern Cocktails in November. And, I've been busy collecting recipes. "With a Twist" will feature all new recipes invented by Northwest bartenders as well as by some talented friends. One of the drinks, the Blackbeer'd, a delicious concoction of navy-proof rum, whiskey and stout, was created by our friend Richard Vander Wende (pictured above). 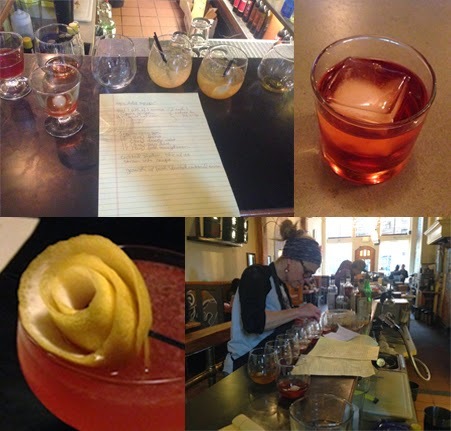 And there's more on the way from Spokane bartenders including Curtis Day, Alison Collins and Kristi Gamble, as well as something special from Ryan at Izakaya Meiji Company in Eugene. Now all I need to do is start painting! And drinking. Clockwise from top left: a pre-lunch tasting session at Boots; Curtis Day's 65th Street Cocktail; Alison Collins tests a new drink; a beautiful garnish by Kristi Gamble.